With reasonable certainty that you will soon have your Italian visa, it’s time to start thinking about moving your stuff to Italy, and llining up moving company candidates. 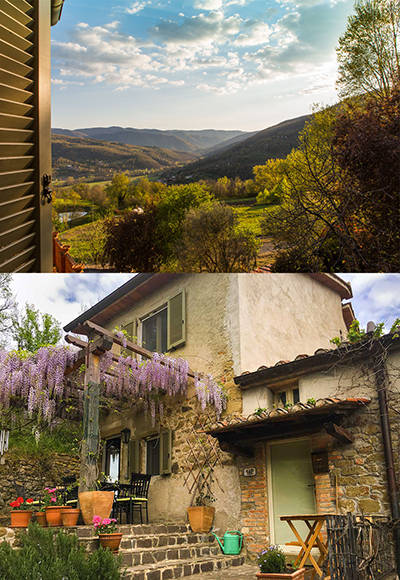 In my situation, I had already furnished my home in Umbria with the basic necessities, and I was determined to pare down dramatically what I had in the U.S. It was time to free myself from the encumbrances of “too much stuff”. Watch “The Paradox of Choice” by Barry Schwartz on Ted Talks if you want some perspective and inspiration for simplifying. This was a real eye-opener for me. I had private garage sales (for friends) and Craigslist help me unload some furniture. In short, I edited down to about 30 boxes, including one for my beautiful Specialized road bike. This meant i would be sharing a container vs. having my own. This is something you will have to ascertain before you talk to movers. I had been talking to several companies, and interest waned with a couple of companies when they figured out I would be “small potatoes” and not worth the return on such a small shipment. You may find that you have enough to have your own container, and then you should be rockin’ along with suitors for your business. Choose a company that can route your shipment through an arrival port in the U.K., and not through Italy. I had heard horror stories of people who had their good shipped through ports and customs in Italy. Such stories helped me to determine going through the U.K. would be far wiser. These stories included scenarios of being notified that a shipment had arrived in Italy and was being held pending missing paperwork/documentation – even when things supposedly were already in order. “Storage” or “holding” fees were imposed until things were cleared up. In some instances, people learned later that their shipments had not yet arrived, yet they already were being charged storage fees. And then again, there are many people who have had this go without a hitch with an Italian point of entry. But, and this is a very big BUT, Italian customs are notoriously inconsistent. In my opinion, if you choose this route, you are taking a very big chance. A shipping agent may assure you all will be fine, but once your goods are in the hands of Italian customs anything can happen. International Van Lines routed my shipment through Felixstowe Port, in England. In essence, my shipment cleared EU customs, and then made it’s way across the Channel and land to Italy. With the right documentation (your moving company will inform you what is needed) you will not have to pay customs on your household goods. You’re granted a one-time duty-free shipment of household goods. Talk to your mover about any significant electronics (e.g. computers) you may be shipping. I designated that my iMac was over a year old, and I attached a copy of the dated purchase invoice to the outside of the box, should there be any questions. If your electronic equipment is less than a year old, you may be required to pay duty on it. When my shipment left the U.S. port, it was first X-rayed/scanned to determine if any prohibited items (your mover will provide a list) stood out. So, be on the up-and-up. For my small shipment, I found the cost to be very reasonable. The only drawback was that I had to wait longer for the delivery of my goods, since I was being consolidated with other shipments. For me it took almost three months. You may want your goods sooner, and that will have to be part of your negotiations. Lastly, make sure your mover knows the conditions of your delivery address. Living up a small rural road in the Umbrian Hills restricted the size and types of vehicles that could make it close to our house. Fortunately, with a small shipment, that wasn’t an issue. If you’re facing a similar situation, but you have a large shipment, your estimate should include a surcharge that shows your shipment being shuttled from a larger truck by a smaller truck to your home. Disclaimer: These are suggestions based on my unique experience and they should, in no way, be a substitute for your own “due diligence” in researching the logistics and legalities of moving your household goods to Italy. Hi there! Thanks so much for all this useful info. I’m in the very early stages of contemplating a move. Do you know what a ball park price range is for moving your stuff? I realize that’s not a simple question to answer, but I’m just trying to get some semblance of an idea. I’d pair down a lot, and I’m currently in a 900 sq ft. city apartment. Hi, It depends on how much furniture and bulky items you plan on bringing. I was in a one-bedroom apt, but I didn’t move sofas beds or dining tables. I bought most furniture at IKEA here. For a small shipment (about 32 boxes and a chest of drawers) I spent around $3,400. It took close to 2 months to receive, but that was fine. International Van Lines was great. They can help with an estimate pretty easily. Thank you for the great advice. In following your footsteps I am feeling comfortable and confident. I am moving to Florence in March and I am simplifying and downsizing my life. I have chosen to ship what remains of my household goods with International Van Lines, they now go through Germany instead of Great Britain but achieve the same result in avoiding an Italian port of entry. They offer a crate of 5’ x 6’ x 7’ (200 cubic feet) from California to Florence for $3,800. What I am finding difficult to understand is what I am allowed to bring into Italy. I have downloaded lists of that which is prohibited from Italian customs, US govt websites, expat blogs and even Fedex. I may be making this worse for all the info I have obtained, but there seems to be that there is very little that is not restricted. I do have the receipts for my two iMacs and one television that I am shipping, thanks for that. Can you share what you encountered with Italian customs with your shipment or any links you might know. Hi Robert, I didn’t have any issues with my small shipment, and it included some of the items on your list. I shipped shoes, books, and dvds. International Van Lines required that I provide a manifest/list detailing the contents of each box. I don’t quite remember, but I think I provided the list to IVL in advance, and that was an opportunity for them to alert me to anything I would have problems shipping. It was double-checked by the guys loading my shipment for transport to the port. I may have put shoes in with clothes and labeled them as clothing. I don’t remember. But, I had at least 20 pairs of shoes. I also had quite a few books. The DVD’s I’m hazy about. I shipped several of my paintings. I had to list a value. And, being the artist I pretty much could attach a lower value. I think the bigger issue is shipping valuable works of art. I understand the restrictions on liquids and things that can “go bad”, flammable or toxic. Since these containers can “sit” for several weeks in transit, it’s even more of an issue. My shipment took about three months to finally arrive at my door in Umbria. I leaned on the expertise of International Van Lines. If you have listed something that concerns them, they will tell you. The one callout for me was my iMac, and they wouldn’t agree to include it in the shipment unless I had the receipt affixed/clearly accessible to the box. You are allowed one duty-free (except for newer electronics) shipment, as a new resident, of your household goods. Individual, international shipments of smaller things that don’t fall under this one-time household shipment are managed differently. This may be why some sources exclude things like books and DVD’s for which Italian customs normally would impose a duty. IVL wisely routes household goods through other EU countries to avoid some of the vagaries and whims of Italian customs. Once your goods land in Germany they won’t be subjected to additional customs in Italy. IVL will also ask for some documentation pertaining to your visa. I don’t remember this part exactly, but I think I also forwarded them my permesso receipt and the documents I got from the questura––anything to further substantiate my new residency and my one-time allowance for household goods.